Vendors, arts and crafts, mutt show, Queen’s coronation and FIREWORKS over the park. The Central Oregon Saturday Market has been a long-time tradition on our “sunny” side of the Cascade Mountains. Bend’s market is a unique and vibrant shopping “choice” in the downtown retail district. 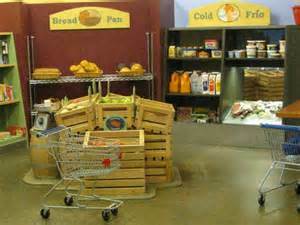 Vendors throughout the Northwest travel to our market every Saturday. In addition, we have the finest artists and craft masters in Central Oregon. Strolling down our aisles in the high desert air with the warm sun on your face…it’s part of what summer in downtown Bend is all about! Where: Located across the street from the Bend Library between Bond and Wall Streets. Presented by Cannon Bch. Arts Assoc. & Coaster Properties. A color guard from the US Coast Guard Group/Air Station Astoria will present the colors at the concert. Military service hymns will also be played to honor veterans, active members and families. Open air concert, so bring blankets/lawn chairs/sun screen/ or an umbrella! Conductor Lee Stromquist will be at the podium assisted by John Hammond. Retired Oregon Symphony bass trombonist Alan Pierce will solo in Cannon Beach on July performing “Variations on Barnacle Bill , the Sailor.” 2:00 pm, Cannon Beach City Park. The days festivities include breakfast, parade, food and fun family entertainment. Fireworks at dusk. An Oregon 150 event. Times: 7:30 a.m. – 11 p.m. Location: Holt Park, 5th & Oregon Sts; Creswell, Phone: 541.895.5161, Admission: Free. “Red, White, Rhapsody in Blue.” Premier art and wine festival in the Southern Willamette Valley. Enjoy entertainment and view over 130 artists in the Artists’ Marketplace and the Art For Your Garden display. On July 4th Jeffrey Kahane and Oregon Bach Festival’s orchestra present a concert of American classics. 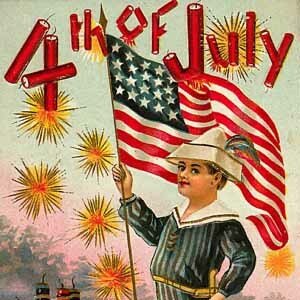 Times: Fri, 11 a.m. – 9:30 p.m.; Sat, 11 a.m. – fireworks; Sun, 11 a.m. – 7 p.m. Location: Alton Baker Park, Eugene, Phone: 541.345.1571, Admission: $6, $15 3-day pass. A holiday tradition that’s the biggest and best running and walking event of the year in Eugene. There’s something for everyone: a 10K (6.2 mile) run and 4.5 Mile Mayor’s Fitness Walk. Both events finish at Skinner Butte Park. Times: Saturday, 8 a.m., www.eclecticedgeracing2.com, Location: shuttle busses to Spencer Butte Middle School, 5th & Pearl for runners, 4th & Mill for walkers; Eugene, Phone: 541.484.9883, Admission: $15, $20 w/shirt. Independence Day Fireworks Event in the Taft area along the beachfront on SW 51st Street, by Mo’s. This year’s program has been ramped up. It will feature “Bigger and Better” fireworks, including a majority of five-inch shells (previous years have used three and four inch shells) that provide a big burst along with the boom! L’Millers’ 4th of July Gala at the Lincoln City Cultural Center. This Arts and Crafts Fair will feature handmade goods from local crafters and artisans. FMI 541-996-4343. One of Newport’s newest traditions. Enjoy local food vendors, arts and crafts, horse drawn buggy rides, games, and fun for the whole family. Proceeds support local non-profits. Admission is free. For more information, call 888-592-5556. 11:00 a.m. – 7:00 p.m.
Watch the sky light up over Yaquina Bay. Helpful Hint: It’s good to show up early to the bayfront or surrounding areas as over 5000 people watch the display! For more information, call 888-592-5556. 9:30 p.m. – 11:00 p.m. Call 541-256-ARTS for information and tickets. 7:30 p.m. – 9:30 p.m. This world-class festival, which has become a must for blues fans from far and wide, runs Thu-Sun, July 2-5. It’s not only four days of excellent music, it’s also a major fundraiser and food gathering function for the Oregon Food Bank. Satisfy your hunger for blues this year with performances by Sharon Jones and the Dap Kings, Johnny Winter, Sonny Landreth and many more. On Friday, treat the family to a day of Zydeco, with music, and dance demonstrations and lessons. Saturday, celebrate the Fourth with fireworks after a day of music and fun. Tom McCall Waterfront Park, Southwest Naito Parkway; $10 donation and two cans of food. 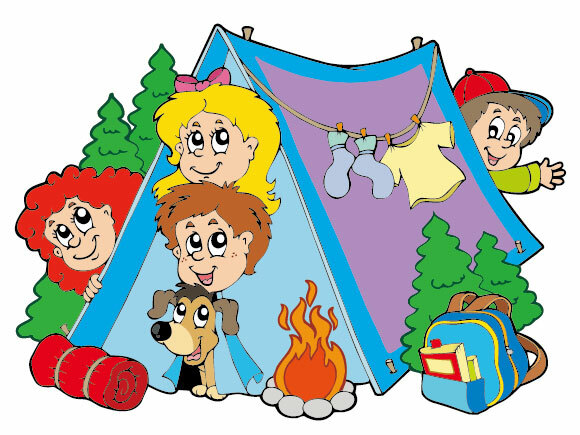 Parade — Flapjack Breakfast — Fishing Contest — Sawing Contest — Clay Shoot — Tug War Competition — Horseshoe Tournament — Strawberry Shortcake — Kids Events — Singing – Drama – Oration – Choir chimes – Sing-a-Long — FIREWORKS! Fri, 10:00am – Sun, 5:00pm. Celebrate Our Nation’s birthday with us. Sip, Sample and Save! We have over 23 wines and almost all will be on sale by the case. Free admission. Tigard’s celebration begins at 6:00 p.m. at the Tigard High School soccer field (corner of Hall Blvd. and Durham Rd.). This Fourth of July event features clowns, live music, games, and police and fire vehicles. Light snacks will be available for sale. Fireworks begin at dusk. Little trails often lead to big discoveries, and that’s when a camera comes in handy for Oregon’s premier landscape photographer Steve Terrill. We strolled along the short graveled trail at Lee Wooden County Park – just off State Highway 202 – and spotted the numerous little signs of the seasonal change; mostly measured by the colorful maple and alder leaves that were in a state of free fall. Terrill called the blizzard of leaves the “little parts that make a bigger, better picture.” Terrill likes to have fun along the little-known backdoor byway that connects the valley to the coast through the heart of the Oregon Coast range. Just a couple miles down the road, large elk lounge across the grassy meadows of the Jewell Wildlife Area. Terrill makes the many easy-to-reach viewing sites a must-stop on his trip. He scanned the scene, searched for movement and soon found the life in the landscape. Two yearling elk rose up on hind legs and boxed at each other with their front legs – it was an elk sparring match as the two youngsters tested each other. It‘s interesting to see one of Oregon’s premier landscape photographers – now on his chosen path for more than three decades – working a favored haunt that anyone can visit. It’s also fun to pick out the little things that he does to make his photos special. Does he ever! Here’s proof: 2013 is year nine for Steve Terrill’s “All Oregon” Calendar. His annual project pays homage to his home state – shot entirely in Oregon by the native son who has it printed here too. A half hour down the byway, Terrill helps himself to all the scenery surrounding one of his favorite waterfalls in all of the state: Youngs River Falls. Don’t forget to peer into the shallows just below the falls; mottled black and grey, several 30-pound salmon have muscled their way back to Youngs River, their birthplace and now the end of the line as they continue their cycle of life. This byway unwinds along Youngs Bay at Astoria, and Terrill finds that each mile of the trip is wonderful and that so much beauty is so close to so many people. Diversity in habitat creates variety in wildlife. Hart Mountain Refuge’s diverse landscape and habitat are alive with over 300 species of wildlife, primarily birds (239) species) and mammals (42 species). Mammals such as pronghorn, deer, coyotes, kangaroo rats, marmots, bobcats, ground squirrels, and rabbits are generally year-round residents of the refuge while most birds come and go with the seasons. Reptiles include rattlesnakes, bull snakes, yellow-bellied racers, and sagebrush lizards. Hart Mountain National Antelope Refuge Hart Mountain National Antelope Refuge is located on a massive fault block ridge that ascends abruptly nearly three-quarters of a mile above the Warner Valley floor in a series of rugged cliffs, steep slopes, and knife-like ridges. Visitors experience spectacular views of the beautiful Warner Valley Wetlands while ascending the west side entrance road to headquarters.The west face of the mountain is cut by several deep gorges. Hart, Potter, and DeGarmo canyons, the most rugged, extend from the valley floor to the top of the main ridge. The east side of the mountain is less precipitous, descending in a series of rolling hills and low ridges to the sagebrush-grasslands typical of southeastern Oregon and the Great Basin. Since its creation in 1936 as a range for remnant herds of pronghorn antelope, management of the refuge has broadened to include conservation of all wildlife species characteristic of this high desert habitat and restoration of native ecosystems for the public’s enjoyment, education, and appreciation. Getting There . . . Hart Mountain National Antelope Refuge is located 65 miles northeast of Lakeview, Oregon, off Highway 140. A moderate hike leads to the petroglyph canyon at Flook Lake. I suggest warming up, though, with an easier walk to the better known rock art of Petroglyph Lake. If you go, be warned that there are no actual trails in this part of the high desert. Only rough roads lead to the starting points for these walks, and they’re about as far from civilization as you’ll find in Oregon. Although rain is rare, the treeless landscape is often raked by windstorms, lightning, blazing heat and snow flurries. 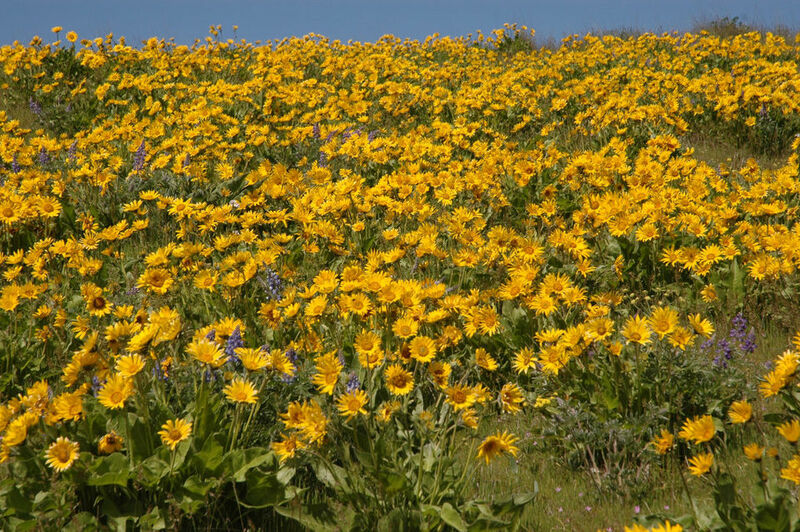 The best weather is perhaps in May and June, when wildflowers join the sagebrush. A good base for your explorations is Hart Mountain’s Hot Springs Campground, with free campsites in a creekside oasis of quaking aspen. The hot springs are also free, with a natural rock pool shielded by low rock masonry walls. Named for the legendary Oregon governor, the point is reached via one of Oregon’s classic trails above Rowena Crest near Mosier. The Nature Conservancy, the landowner, requests no dogs on this trail. The upper trail opens annually May 1, but a lower train on Rowena Crest is open all year. 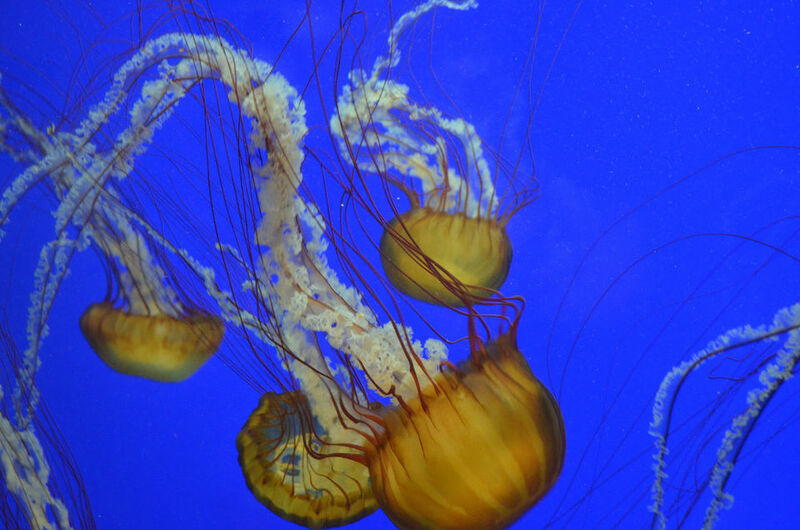 Oregon coast aquarium is a must-visit attraction when in this state. Kids and adults alike get a lot of fun when they interact with different sea creatures. There are more than 15,000 species of animals here. Some are very strange and it will amaze you that there are creatures like these roaming our planet.The amazement will turn into an appreciation of how beautiful our planet is. Enchanted Forest is a theme park located in Salem, Oregon. 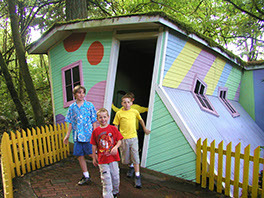 Opened in 1971 by park creator, Roger Tofte, Enchanted Forest has grown into Oregon’s premier amusement park with over 20 acres of rides, entertainment, shopping, dining, and hands-on attractions. To learn more about Enchanted Forest’s rich history, visit our History Page, or better yet, come visit us! Portland Children’s Museum is the museum that doesn’t act like a museum. You won’t find any velvet ropes inside, and playing with and touching our exhibits is strongly encouraged. Our main exhibit is the imagination of the children who play here. Our permanent and traveling exhibits are designed and developed to encourage problem solving, imagination, and the wonder of learning. With every visit, your child will walk away with a unique experience that celebrates their creativity. Come explore our exhibits and find out which one is your child’s favorite! Cascades Raptor Center is located in south Eugene on the side of Spencer Butte. Birds are on display in large, outdoor aviaries viewed by walking winding, hillside trails. These woodland, gravel paths have a moderate grade in some locations. This one-of-a kind Museum reveals the nature of things in the West’s high desert through artful exhibits, alluring animals, engaging programs and meaningful history. The High Desert Museum has been inspiring families since 1982 and is consistently rated as the top Central Oregon attraction by Trip Advisor. With 135 acres and more than 100,000 square feet of exhibit space, it’s a “must see” for anyone travelling through the area. Team Pendley with RE/MAX Integrity We Go The Extra Mile, It’s Less Crowded! Minutes from Bend, Redmond, Sunriver and Sisters, Oregon, Mt. Bachelor Ski Resort offers nearly 3700 acres of varied terrain and sits in the high desert of the Central Cascades and is known for dry snow and great skiing and riding. Located on the sunny, wind protected side of Mt. Hood, this mountain features some of the dryest snow in the Northwest with 65 trails over 960 acres. The largest night ski area in America. At a 7,100 foot base elevation, Anthony Lakes is the highest base elevation in Oregon. Located in the Elkhorn Range of the Blue Mountains. It’s also known for some of the most amazing nordic skiing in the Northwest. Winter fun and activities for the entire family nestled on the northeastern slopes of Mt. Hood National Forest. Enjoy views of three different mountain peaks. A small ski resort that was founded by a group of ski enthusiasts back in the 1930s near the small mountain town of Joseph. The ski area has one T-bar lift and one tow-rope with eight skiable trails. Located high in the Orgeon Cascades. The majority of Hoodoo’s 800 skiable acres rest on the northern slope. Nordic skiers can get away from it all on 18.5 km of cross-country trails. A family oriented ski area located in the heart of the Southern Oregon Alps near the Oregon /California border. Neighbour to Mt. Hood Meadows and 65 miles east of Portland. Advertised as America’s largest night ski area. Resort situated on the Tollgate Summit in the Blue Mountains in northeast Oregon. 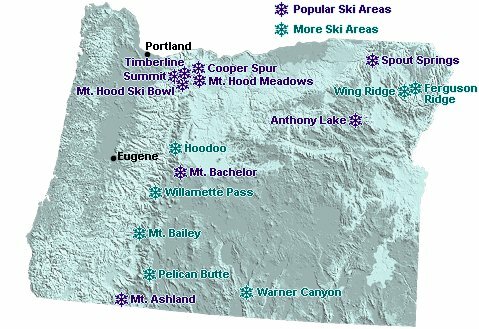 Spout Springs is the oldest continuous operating ski area in Oregon. The Pacific Northwest’s oldest ski area. Located on Mount Hood. Summit’s base elevation is 4,000 feet and has 306 feet of vertical lift for skiing. On the edge of the snowfields in the Cascade mountains. Info for ski area operated by the non-profit Fremont Highlander Ski Club. Located in the Fremont National Forest in Oregon. 29 runs and 1,563 vertical feet await you from the summit of Eagle Peak and Peak Two. Willamette Pass is located at milepost 62, 70 miles East of Eugene, Oregon, on Highway 58.